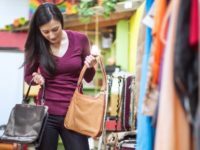 The change of seasons can cause us to look into the closet and think, “I want something new.” However, “new” doesn’t have to mean “brand-new,” instead it could mean “new-to-you.” Often what we want is just something different — buying secondhand is a way to save money while practicing reuse. Check online for nearby Goodwill or other thrift stores at The Thrift Shopper. Stop by garage sales in your neighborhood. Host a clothes-swap with your friends. For more ideas, read Wear.Donate.Recycle. and 9 Tips for Summertime Shopping.